Jet Airways has already defaulted in paying loans and it has informed that it will default in making more payments which are due this month. I reiterate that IBC appears to be the best thing that can happen to Jet Airways under the present circumstances whereby adequate management and fund infusion may be expected to occur. 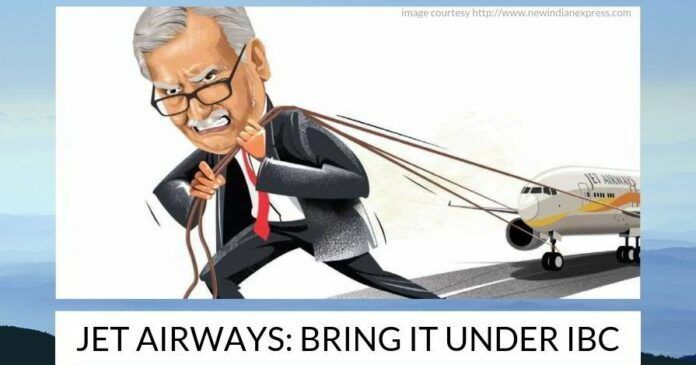 Jet Airways is facing a huge financial crisis, which has resulted in it being unable to pay rent for leased aircraft and interest on finances. Due to non-payment of lease rentals, leases have grounded dozens of aircraft operated by the airlines, resulting in the cancellation of flights. According to reports, the total number of grounded aircraft has reached around 60, which is approximately half of the fleet size of 119 planes. Other than non-payment to creditors, the airline is also facing trouble in paying salaries, and they have not paid salaries to their maintenance staff for three months. Banks are reportedly likely to infuse fresh funds into cash-strapped Jet Airways (India) Ltd. provided that major shareholders of the airline, including Gulf carrier Etihad Airways, pledge their shares as collateral. I had written in my article ‘The travails of Jet Airways’ in Merinews on 03/11/2018 the following: Now for Jet Airways mess, obviously, the present foreign controlled owners and management are responsible for they did not or could not build up a reserve when the fuel prices were low for meeting contingencies such as it is now. Therefore, hopefully, they will relinquish management control and sell off their controlling holdings in favor of an interested professional and cash-rich group at a proper valuation well before the situation becomes hopeless. Etihad Airways, which owns 24% in Jet, was to infuse capital into the airlines to solve its financial crisis, but the talks are stalled over several disagreements. Etihad has not agreed to a debt resolution plan proposed by lenders of Jet Airways, led by State Bank of India. According to the proposal, the consortium of lenders, will convert its loans into shares and pump in an additional Rs 1,000 crore to raise its stake to 29.5%. On the other hand, Etihad was also expected to infuse between Rs 1,600 crore and Rs 1,900 crore to raise its shareholding to 24.9%. Another contentious issue is the perpetuity requirement included in the proposal. The proposal seeks to limit promoter shareholding to 22%, but Naresh Goyal, the 52% shareholder, is asking it to be dropped. Etihad is also not agreeing to the proposal to add two nominee directors from promoter group. This appears to be a stalemate situation. Jet Airways has already defaulted in paying loans and it has informed that it will default in making more payments which are due this month. The Airline has a debt of more than Rs 8400 crores, which continues to rise as interest gets added to that. Banks are reportedly likely to infuse fresh funds into cash-strapped Jet Airways (India) Ltd. provided that major shareholders of the airline, including Gulf carrier Etihad Airways, pledge their shares as collateral. In my article ‘Is IBC the solution to the travails of Jet Airways?’ in Opindia, dated 5/1/2019, I had indicated and now I reiterate that IBC appears to be the best thing that can happen to Jet Airways under the present circumstances whereby adequate management and fund infusion may be expected to occur. Previous articleModern day Hiranyakashipu and Prahlad? What has Modi given to Indians in the preceding 4 years? The Ghost investors might have vanished from the scene. That’s why the turmoil. This is also the Karma effect. Jet airways jettisoned the growth of KFA and ensured that they are out of business. Mr. Goyal ensured that KFA did not get the required approval from the then Union Govt for FDI, resulting in the fall of KFA. The same is now being faced by the Jet Airways. # Read Lee Iococa – an autobiography ; how he struggled to bail out Chrysler Corporation of US. If individual promoters mismanage, let them go to hell! No patronage be extended. Ref: jet airways !